The Enterprise Architect ribbons provide access to the functions and facilities of the system, grouped according to work area. If you do not work with the facilities of a certain area, such as Coding or Simulation, you can easily hide either selected panels of the corresponding ribbon, or the whole ribbon. As a further example, the 'Show' panel displays as a part of every ribbon; you could choose to display it on one or two ribbons and hide it on the rest. When you open Enterprise Architect, the Start ribbon is displayed by default. You can set one of the other ribbons to be the default displayed on opening the system. Click on the white arrowhead to the left of a ribbon name, to display the list of panels within the ribbon. To hide a selected panel, clear the 'Enable' checkbox against the panel name. To hide all panels in the ribbon, clear the 'Enable' checkbox against the ribbon name. Conversely, clearing all the panel checkboxes for a ribbon hides the whole ribbon (you cannot display an empty ribbon). To redisplay a panel or ribbon, select the corresponding 'Enable' checkbox. Selecting a panel within a hidden ribbon shows the ribbon again. Selecting to show a hidden ribbon selects the checkboxes against all its panels; you can then clear individual panels as required. If you have cleared a number of ribbons and/or panels, you can restore the complete set of ribbons and panels by clicking on the Reset button. 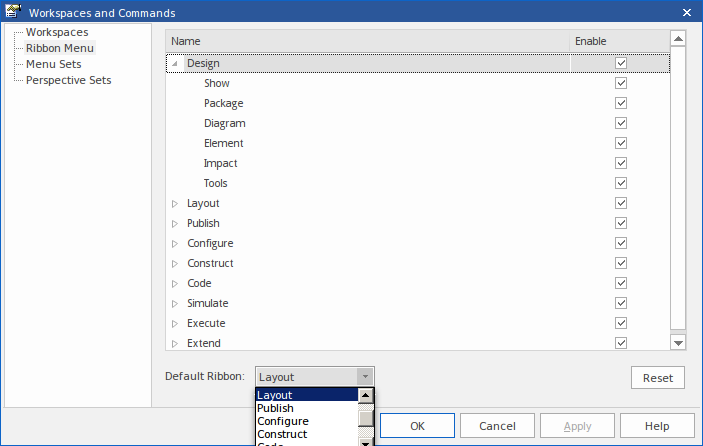 If you want to change the default ribbon shown on opening Enterprise Architect, click on the drop-down arrow in the 'Default Ribbon' field at the foot of the page and select the appropriate ribbon name. Click on the OK button to save your settings and close the dialog.